A two-year-old startup today unveiled two new 3D metal printing machines, one of which can create prototypes and the other production parts faster and cheaper than existing technology, the vendor says. Desktop Metal, based in Burlington, Mass., demonstrated the Desktop Metal (DM) Studio System, which it calls an "office-friendly" metal 3D-printing system for rapid prototyping, and the DM Production, a manufacturing-class printer it claims is 100 times faster than today's laser sintering machines. The DM Studio System includes both a printer and microwave-enhanced sintering furnace that can produce metal 3D printed parts in an engineer's office or on a shop floor. The company claims its DM Studio System is 10 times less expensive than existing metal prototyping technology. Customers can reserve the Studio System in May, with shipping beginning in September 2017. The printer sells for $49,900 and the complete system -- including printer, debinder, and furnace -- is $120,000. For its part, the DM Production System is available on reserve in May, for shipping beginning in 2018. Pricing for the Production system has not yet been announced, but the printer is expected to cost around $360,000 (with additional equipment pricing to be determined). Pete Basiliere, research vice president for additive manufacturing at Gartner, said existing laser or electron beam sintering 3D printers cost from $165,000 to $1,765,000. "We cannot know if Desktop Metal’s 3D print results are comparable with existing powder bed fusion devices’ results until the same parts are built with both technologies and are then tested for appearance, performance and quality," Basiliere said. Terry Wohlers, principal consultant and president of industry research firm Wohlers Associates, said the DM Studio System is significantly less expensive than existing technology -- though he could not confirm the "10 times" figure the vendor claims -- and said the machine's ability to print with up to 30 alloys is "pretty impressive." "Most metal [powder bed fusion] systems do not support nearly this many," Wohlers said in an email to Computerworld. Metal powder bed fusion 3D printing (also known as additive manufacturing) processes use either a laser or an electron beam to fuse together successive layers of powdered alloys to build an object. Both the Studio and Production systems require a post-process furnace cycle, Wohlers explained, which is where the actual sintering and melting of the alloys occurs. "It's difficult to know the size of the potential market, but if the company can have success in the automobile market, it could be quite large," Wohlers said. "The automotive industry is likely the 'sweet spot' for the Production System. Companies doing small volumes of production parts may consider the Studio System. The company is positioning it for the prototyping of metal parts." Since its inception in October 2015, Desktop Metal claims it has raised $97 million in venture capital and attracted major investors, including GV (formerly Google Ventures), BMW Group, GE, Lowe's, NEA, Kleiner Perkins Caufield & Byers, Lux Capital, Saudi Aramco, and 3D printing leader Stratasys. Desktop Metal's Production System 3D printer set up as on a factory floor. Uwe Higgen, a managing partner of BMW i Ventures, the carmaker's venture capital arm, said there's "a huge potential for the highly competitive automotive industry to accelerate product development and production" with additive manufacturing. "Desktop Metal's technology offers a new way for the manufacturing industry to be smarter, faster and more cost effective with metal 3D printing," Higgen said in a press release from Desktop Metal. Don Jones, the global parts strategy manager for construction equipment manufacturer Caterpillar Inc., stated in the same news release that the company's parts network has 21 distribution centers around the world, with hundreds of thousands of parts used in over 2,000 dealer locations. "By leveraging a portion of 3D printing for metal parts, we will be able to enhance best-in-class service with lower inventory investment," Jones said. "We are excited to evaluate the Desktop Metal suite of products, which will allow us to print metal parts at high speed and minimal post processing and environmental constraints closer to our customers, reducing the need to expedite ship critical parts from across the globe." The DM Production System 3D printer can build parts up to 13-in x 13-in x 13-in, which is not small, Wohlers pointed out. "However, as the size increases, the throughput [speed] per part declines," Wohlers said. The DM Studio System can build parts up to 12-in x 8-in x 8-in in size. Desktop Metal said the Studio System printer is safe for office use because it doesn't rely on traditional metal 3D printing processes that use metal powders that are melted together on a print platform and it also has no cutting tools as a CNC metal router would. Instead, the Studio System uses a proprietary technology it calls Bound Metal Deposition, which is similar to today's most prominent 3D printing technology -- fused deposition modeling (FDM), which melts thermoplastics and extrudes it layer by layer to build an object. Instead of plastics, the Studio System extrudes a myriad of different alloys which are then bound in the post-process furnace. Desktop Metal's Studio System uses a "debinding step" necessary to remove the primary binding agent within the metal alloy material. The Production System does not require a debinder. Because it operates similarly to a FDM 3D printer, there's no need for dedicated operators, Desktop Metal explained in its marketing materials. The machine relies on cloud-based software that allows a single, seamless workflow to move from the part's creation on computer-aided design software to sending printable files to the machines. The Studio System offers swappable print cartridges for fast material changes. The Production System uses a proprietary Single Pass Jetting (SPJ) technology, that the company claims is 100 times faster than today's laser-based additive manufacturing systems. "I find it very interesting that Desktop Metal is bringing two 3D printers employing two different technologies to market," Basiliere said. "The Studio [System] is a material extrusion device while the production machine will be a powder bed fusion device. Other companies would have offered a desktop device and a production device with both using one technology and material set." The Production System, Desktop Metal claims, can dramatically reduce the cost-per-part when compared with today's laser-based systems, "for the first time making it competitive with mass production techniques like casting," the company stated in its press release. 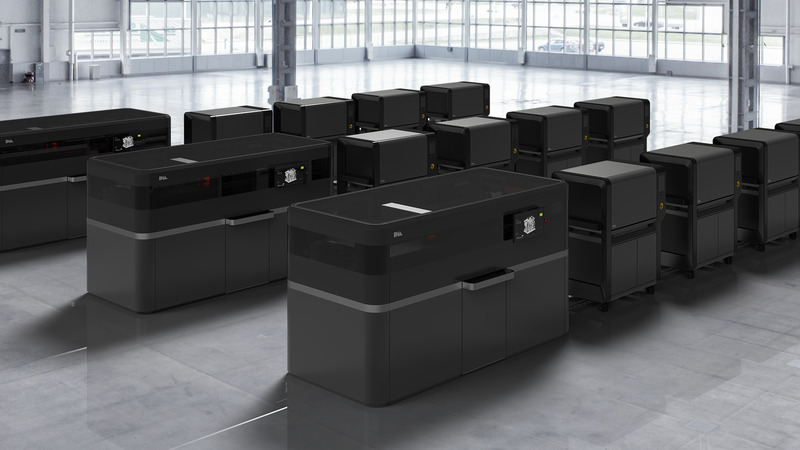 As with HP’s Multi Jet Fusion 3D printer, Desktop Metal’s single pass jetting printer technology will be "orders of magnitude faster than existing powder bed fusion printers," Basiliere said. "Whether that is 100x [faster] remains to be seen. Importantly, the 3D printer’s speed is only one element that has to be considered. Throughput is more important than speed," Basiliere continued. "The total elapsed time to make the 3D printer ready to run plus printing time plus post-processing time have to be compared." The market for enterprise desktop metal printers, Basiliere said, could be quite large for three reasons. First, the desktop devices provide another step in the iterative prototyping process that can be used to make models in metal that are close to what will be made in production, whether the part is made with conventional techniques or additive manufacturing. Second, desktop metal printers can output robust tools, jigs and fixtures that are then used to make goods with conventional manufacturing processes. Third, printers could also make finished goods, whether for consumers or businesses, if the appearance, performance and quality are adequate for use.